Do Hedge Funds and Insiders Love Geron Corporation (GERN)? Is Geron Corporation (NASDAQ:GERN) a healthy stock for your portfolio? Money managers are in an optimistic mood. The number of long hedge fund bets moved up by 2 lately. According to most stock holders, hedge funds are perceived as underperforming, old investment vehicles of the past. While there are more than 8000 funds trading at present, we at Insider Monkey look at the upper echelon of this group, close to 450 funds. It is widely believed that this group oversees most of the hedge fund industry’s total asset base, and by monitoring their top investments, we have found a few investment strategies that have historically outstripped the market. Our small-cap hedge fund strategy outpaced the S&P 500 index by 18 percentage points per year for a decade in our back tests, and since we’ve started sharing our picks with our subscribers at the end of August 2012, we have beaten the S&P 500 index by 24 percentage points in 7 months (see all of our picks from August). Just as important, positive insider trading activity is another way to break down the financial markets. There are a variety of reasons for an upper level exec to sell shares of his or her company, but just one, very obvious reason why they would buy. Several academic studies have demonstrated the valuable potential of this method if you know where to look (learn more here). Keeping this in mind, it’s important to take a glance at the latest action regarding Geron Corporation (NASDAQ:GERN). What have hedge funds been doing with Geron Corporation (NASDAQ:GERN)? In preparation for this year, a total of 7 of the hedge funds we track held long positions in this stock, a change of 40% from the previous quarter. With hedgies’ sentiment swirling, there exists an “upper tier” of key hedge fund managers who were upping their stakes considerably. 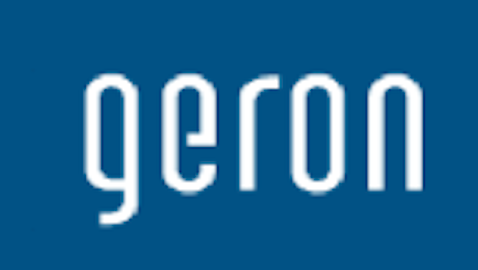 As aggregate interest increased, specific money managers have jumped into Geron Corporation (NASDAQ:GERN) headfirst. Baker Bros. Advisors, managed by Julian Baker and Felix Baker, established the most valuable position in Geron Corporation (NASDAQ:GERN). Baker Bros. Advisors had 1.4 million invested in the company at the end of the quarter. John Overdeck and David Siegel’s Two Sigma Advisors also made a <$1 million investment in the stock during the quarter. The only other fund with a brand new GERN position is Steven Cohen’s SAC Capital Advisors. What have insiders been doing with Geron Corporation (NASDAQ:GERN)? Bullish insider trading is particularly usable when the primary stock in question has experienced transactions within the past half-year. Over the latest half-year time period, Geron Corporation (NASDAQ:GERN) has seen 1 unique insiders buying, and 1 insider sales (see the details of insider trades here). Let’s check out hedge fund and insider activity in other stocks similar to Geron Corporation (NASDAQ:GERN). These stocks are ZIOPHARM Oncology Inc. (NASDAQ:ZIOP), Targacept , Inc. (NASDAQ:TRGT), Pacific Biosciences of California (NASDAQ:PACB), Chelsea Therapeutics International Ltd. (NASDAQ:CHTP), and ImmunoCellular Therapeutics Ltd (NYSEAMEX:IMUC). This group of stocks belong to the biotechnology industry and their market caps are similar to GERN’s market cap. Hedge Funds Are Crazy Bullish On GATX Corporation (GMT) Do Hedge Funds and Insiders Love J2 Global Inc (JCOM)? Hedge Fund News: T. Boone Pickens, Alan Howard, Herbalife Ltd. (HLF) Here is What Hedge Funds Think About Empresa Nacional de Electricidad (ADR) (... Netflix, Inc. (NFLX): The 10 Most Bullish Mega-Hedge Funds Do Hedge Funds and Insiders Love The E.W. Scripps Company (SSP)?